Dr. Chang is a Radiology Resident and Dr. Huang is an Assistant Radiologist in the Division of Musculoskeletal Imaging and Intervention, Department of Radiology, Massachusetts General Hospital, Boston, MA. In addition, Dr. Huang is an Instructor of Radiology at Harvard Medical School, Boston, MA. 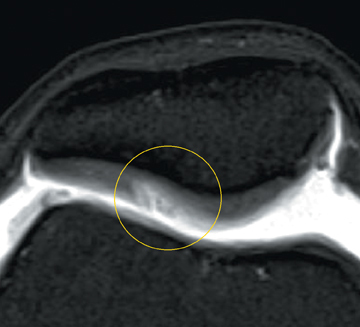 This article is based on “MR of articular cartilage lesions,” presented at Sports Medicine 2010: Advances in MRI and Orthopaedic Management, Department of Continuing Education, Harvard Medical School, Boston, MA, May 9, 2010. 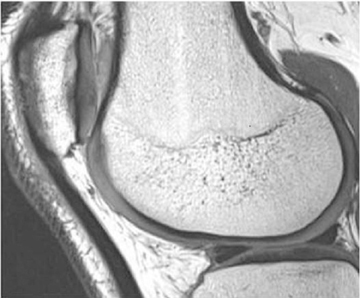 Osteoarthritis is a highly prevalent disease in the United States population, with approximately 75% of persons over age 65 having radiographic evidence of degenerative changes, and nearly two-thirds of routine knee magnetic resonance imaging (MRI) demonstrating articular cartilage damage.1 Therefore, careful evaluation of the articular cartilage is an important part of the knee MRI examination. 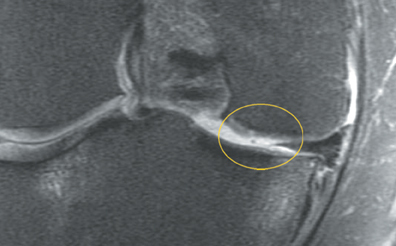 Cartilage defects appear as synovial fluid-filled, T2 hyperintense gaps that disrupt the articular surface. The International Cartilage Repair Society (ICRS) has standardized the evaluation of articular cartilage injury based on the depth of the lesion. The lesion can be described as a superficial defect or surface irregularity (Figure 4), partial-thickness defect (Figure 5), or full-thickness defect (Figure 6). If spatial resolution allows, it may be possible to further subdivide partial thickness defects into low-grade and high-grade partial thickness defects depending on whether the lesion involves less than 50% or 50% to 99% of the full cartilage thickness. Partial and full-thickness lesions may be associated with flap formation (Figure 7). Numerous classification schemes exist for grading cartilage lesions, most of which take into account the size (area) and/or depth of the lesion. The ICRS has developed one such system, in which lesions are graded 0 to 4 based on depth of the lesion (Table 2). Grade 1 and 2 lesions have excellent prognosis. Grade 2 and 3 lesions may benefit from cartilage debridement or other more conservative surgical measures. Grade 4 lesions extend into the subchondral bone and may require bone grafting if bony cavitation is extensive. 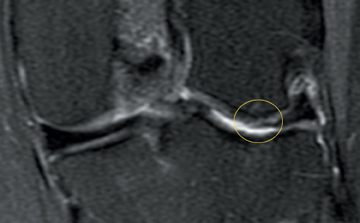 Subchondral marrow edema is more likely to be associated with higher-grade lesions30 and, in the setting of acute trauma, indicates that the lesion may be full thickness. 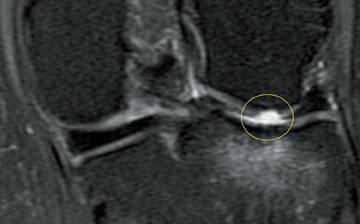 Since the grading of cartilage lesions is largely a matter of local practice preference and no one classification scheme is overwhelmingly used over all others, our practice reports the size, depth, and location of the cartilage lesion to allow the referring physicians to fit the lesion into their own grading system. Cartilage disease can be separated into 3 broad categories: acute chondral or osteochondral injury, osteoarthritis, and inflammatory arthritis. There are some distinguishing characteristics of each category. An acute lesion has sharp margins oriented perpendicular to the bone surface, occurs on weight-bearing surfaces, and has subjacent bone marrow edema (Figure 8).23,26 The fractured cartilage may break off as a “loose” fragment; searching for these intra-articular bodies on knee MRI in acute chondral injury is imperative because of the implications for surgery. 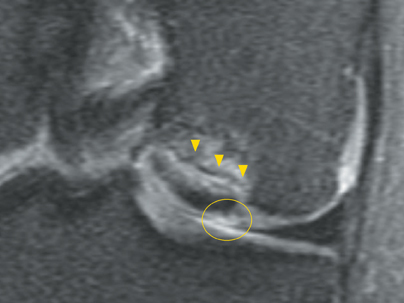 Preoperative detection of a cartilage flap associated with a meniscal tear is important in presurgical planning for the surgeon and modulating expectations for length of rehabilitation time for the patient.35 Cartilage loss following menisecectomy may be accelerated (Figure 11); therefore, meniscal debridement has largely replaced total meniscectomy in the surgical management of meniscal tears to preserve stability and function and to delay the onset of osteoarthritis.20,36 MRI is helpful in imaging the postoperative knee because it can be clinically difficult to distinguish between a meniscal retear, a chondral lesion, or an osseous lesion as the source of symptoms in the post-meniscectomy knee. The mechanism of injury in anterior cruciate ligament (ACL) ruptures includes significant axial loading. The articular cartilage transmits these forces, and this initial impact results in cartilage changes that often lead to accelerated osteoarthritis, despite immediate stabilization of the knee with ACL reconstruction (Figure 12). The sulcus terminalis on the lateral femoral condyle and the posterolateral tibial plateau—also the location of the “kissing contusions” associated with ACL tears—are the most common locations for these cartilage lesions. Graft quality. The graft ideally should fill in the defect and be level with the articular surface. The signal intensity of the graft should match the signal intensity of the adjacent native cartilage. A failed graft may appear fragmented, demonstrate surface irregularity, or be resorbed. Graft incorporation. A well-incorporated graft will be practically seamless with the adjacent cartilage. 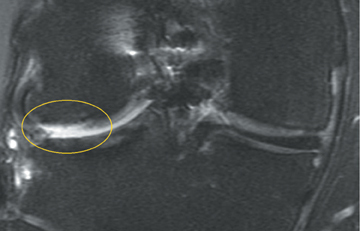 A poorly incorporated graft may demonstrate persistent fluid signal separating the graft and the bone, new subchondral cyst formation, and/or new adjacent sclerosis. Native cartilage quality. Accelerated osteoarthritis, including cartilage loss and other cartilage lesions, may form as the consequence of altered mechanics from the primary cartilage injury. Other. Joint synovitis or adhesions near the repair site may cause the patient symptoms unrelated to the cartilage graft itself. 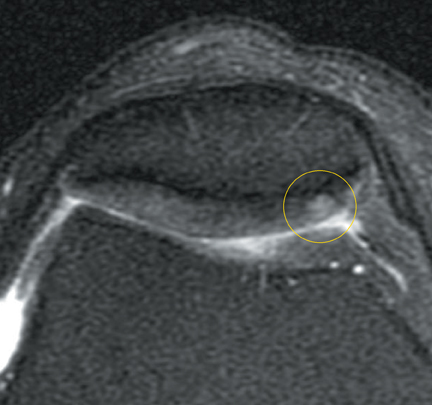 Cartilage lesions are very commonly seen on knee MRI imaging. Current imaging techniques accurately diagnose and grade cartilage lesions, and developing techniques for physiologic imaging show promise for longitudinal evaluation of normal, degenerated, and postsurgical cartilage. 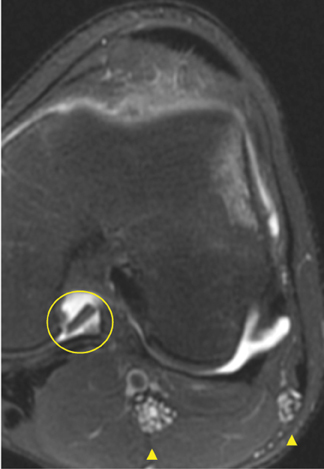 As medical and surgical therapies improve, MRI will play an increasing role in diagnosis and management of knee cartilage lesions, and familiarity with lesion terminology and accurate descriptions of cartilage lesions will enhance communication between radiologists and referring physicians. Disler DG, McCauley TR, Kelman CG, et al. Fat-suppressed three-dimensional spoiled gradient-echo MR imaging of hyaline cartilage defects in the knee: Comparison with standard MR imaging and arthroscopy. AJR Am J Roentgenol. 1996;167:127-132. Bredella MA, Tirman PF, Peterfy CG, et al. Accuracy of T2-weighted fast spin-echo MR imaging with fat saturation in detecting cartilage defects in the knee: Comparison with arthroscopy in 130 patients. AJR Am J Roentgenol. 1999;172:1073-1080. Sonin AH, Pensy RA, Mulligan ME, Hatem S. Grading articular cartilage of the knee using fast spin-echo proton density-weighted MR imaging without fat suppression. AJR Am J Roentgenol. 2002;179:1159-1166. Potter HG, Linklater JM, Allen AA, et al. 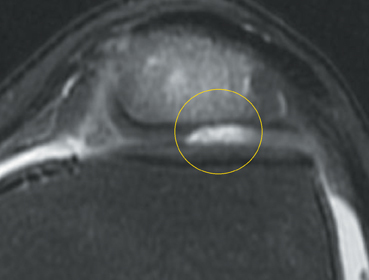 Magnetic resonance imaging of articular cartilage in the knee. An evaluation with use of fast-spin-echo imaging. J Bone Joint Surg Am. 1998;80:1276-1284. Disler DG, McCauley TR. 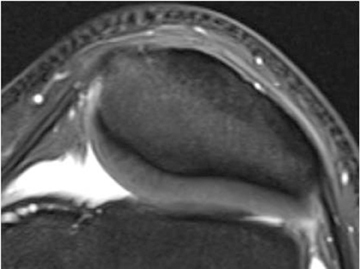 Clinical magnetic resonance imaging of articular cartilage. Top Magn Reson Imaging. 1998;9:360-376. Gold GE, Hargreaves BA, Stevens KJ, Beaulieu CF. 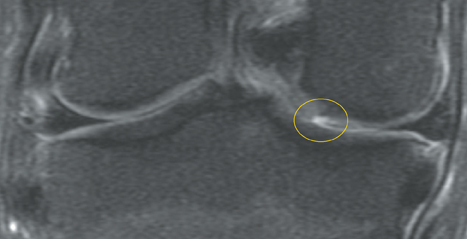 Advanced magnetic resonance imaging of articular cartilage. Orthop Clin North Am. 2006;37:331-347, vi. Hayes CW, Conway WF. 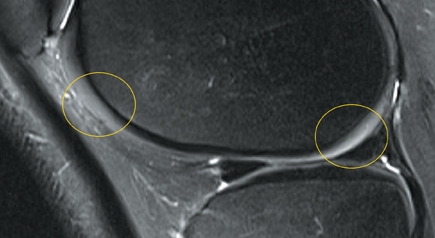 Evaluation of articular cartilage: Radiographic and cross-sectional imaging techniques. Radiographics. 1992;12:409-428. Waldschmidt JG, Rilling RJ, Kajdacsy-Balla AA, et al. In vitro and in vivo MR imaging of hyaline cartilage: Zonal anatomy, imaging pitfalls, and pathologic conditions. Radiographics. 1997;17:1387-1402. Masi JN, Sell CA, Phan C, et al. Cartilage MR imaging at 3.0 versus that at 1.5 T: Preliminary results in a porcine model. Radiology. 2005;236:140-150. Link TM, Sell CA, Masi JN, et al. 3.0 vs 1.5 T MRI in the detection of focal cartilage pathology--ROC analysis in an experimental model. Osteoarthritis Cartilage. 2006;14:63-70. Kijowski R, Blankenbaker DG, Davis KW, et al. Comparison of 1.5- and 3.0-T MR imaging for evaluating the articular cartilage of the knee joint. Radiology. 2009;250:839-848. Hargreaves BA, Gold GE, Lang PK, et al. MR imaging of articular cartilage using driven equilibrium. Magn Reson Med. 1999;42:695-703. Hargreaves BA, Gold GE, Beaulieu CF, et al. Comparison of new sequences for high-resolution cartilage imaging. Magn Reson Med. 2003;49:700-709. Gold GE, McCauley TR, Gray ML, Disler DG. What’s new in cartilage? Radiographics. 2003;23: 1227-1242. Burstein D, Velyvis J, Scott KT, et al. Protocol issues for delayed Gd(DTPA)(2-)-enhanced MRI (dGEMRIC) for clinical evaluation of articular cartilage. Magn Reson Med. 2001;45:36-41. Lammentausta E, Kiviranta P, Nissi MJ, et al. T2 relaxation time and delayed gadolinium-enhanced MRI of cartilage (dGEMRIC) of human patellar cartilage at 1.5 T and 9.4 T: Relationships with tissue mechanical properties. J Orthop Res. 2006;24: 366-374. Bashir A, Gray ML, Hartke J, Burstein D. Nondestructive imaging of human cartilage glycosaminoglycan concentration by MRI. Magn Reson Med. 1999;41:857-865. Reddy R, Insko EK, Noyszewski EA, et al. 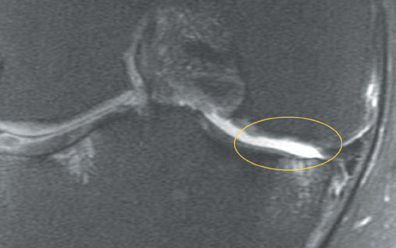 Sodium MRI of human articular cartilage in vivo. Magn Reson Med. 1998;39:697-701. Recht M, Bobic V, Burstein D, et al. 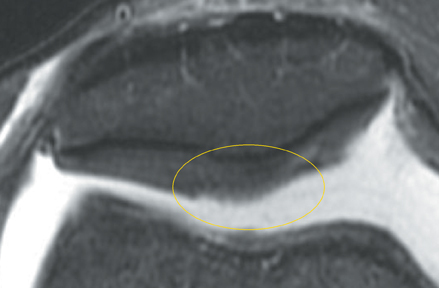 Magnetic resonance imaging of articular cartilage. Clin Orthop Relat Res. 2001;(391 Suppl):S379-S396. Recht MP, Kramer J. MR imaging of the postoperative knee: A pictorial essay. Radiographics. 2002;22:765-774. 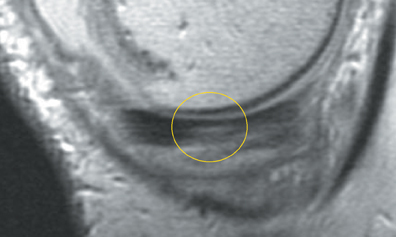 Van Breuseghem I. Ultrastructural MR imaging techniques of the knee articular cartilage: Problems for routine clinical application. Eur Radiol. 2004;14:184-192. Gagliardi JA, Chung EM, Chandnani VP, et al. Detection and staging of chondromalacia patellae: Relative efficacies of conventional MR imaging, MR arthrography, and CT arthrography. AJR Am J Roentgenol. 1994;163:629-636. Chung CB, Isaza IL, Angulo M, et al. MR arthrography of the knee: How, why, when. Radiol Clin North Am. 2005;43:733-746, viii-ix. Miller TT. MR imaging of the knee. Sports Med Arthrosc. 2009;17:56-67. Goodwin DW, Zhu H, Dunn JF. In vitro MR imaging of hyaline cartilage: Correlation with scanning electron microscopy. AJR Am J Roentgenol. 2000;174:405-409. Jeffrey DR, Watt I. Imaging hyaline cartilage. Br J Radiol. 2003;76:777-787. Burstein D, Bashir A, Gray ML. 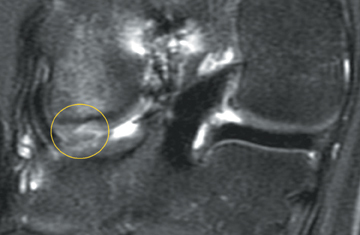 MRI techniques in early stages of cartilage disease. Invest Radiol. 2000;35:622-638. Rose PM, Demlow TA, Szumowski J, Quinn SF. 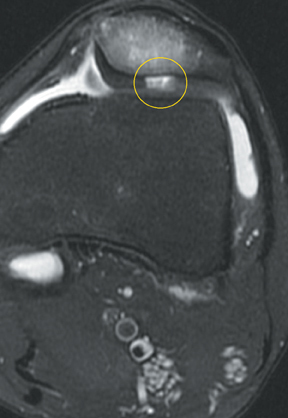 Chondromalacia patellae: Fat-suppressed MR imaging. Radiology. 1994;193:437-440. Mosher TJ, Dardzinski BJ, Smith MB. Human articular cartilage: Influence of aging and early symptomatic degeneration on the spatial variation of T2--preliminary findings at 3 T. Radiology. 2000;214:259-266. Kijowski R, Stanton P, Fine J, DeSmet A. Subchondral bone marrow edema in patients with degeneration of the articular cartilage of the knee joint. Radiology. 2006;238:943-949. Brittberg M, Winalski CS. Evaluation of cartilage injuries and repair. J Bone Joint Surg Am. 2003;85-A Suppl 2:58-69. Dardzinski BJ, Mosher TJ, Li S,et al. Spatial variation of T2 in human articular cartilage. Radiology. 1997;205:546-550. Kleemann RU, Krocker D, Cedraro A, et al. Altered cartilage mechanics and histology in knee osteoarthritis: Relation to clinical assessment (ICRS Grade). Osteoarthritis Cartilage. 2005;13:958-963. De Smet AA, Ilahi OA, Graf BK. Untreated osteochondritis dissecans of the femoral condyles: Prediction of patient outcome using radiographic and MR findings. Skeletal Radiol. 1997;26:463-467. Potter HG, Foo LF. 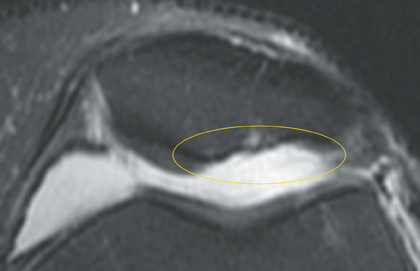 Magnetic resonance imaging of articular cartilage: Trauma, degeneration, and repair. Am J Sports Med. 2006;34:661-677. Cicuttini FM, Forbes A, Yuanyuan W, et al. Rate of knee cartilage loss after partial meniscectomy. J Rheumatol. 2002;29:1954-1956. Johnson DL, Urban WP, Caborn DN, et al. 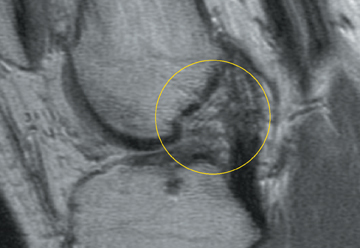 Articular cartilage changes seen with magnetic resonance imaging-detected bone bruises associated with acute anterior cruciate ligament rupture. Am J Sports Med. 1998;26:409-414. Choi YS, Potter HG, Chun TJ. MR imaging of cartilage repair in the knee and ankle. Radiographics. 2008;28:1043-1059. Kelly BT, Potter HG, Deng XH, et al. Meniscal allograft transplantation in the sheep knee: Evaluation of chondroprotective effects. Am J Sports Med. 2006;34:1464-1477. MR of articular cartilage lesions of the knee. Appl Radiol.